The Milwaukee region has been the epicenter of Wisconsin’s long and complicated love affair with bicycling since the last decades of the nineteenth century. In January 1869, a young man named Joshua G. Towne rode a velocipede—the all wood-and-iron frontrunner to today’s more modern bicycle design—through the city for the first time. Milwaukee residents soon recognized that the velocipedes were impractical for the state’s still-primitive road conditions. As bicycle design advances occurred elsewhere, such innovations helped lead to a resurgence of statewide interest in bicycling by the late 1870s and early 1880s, as gender-exclusive “hi-wheel” bicycles became the norm. After the state’s first high-wheel ride occurred at Racine in 1879, local bicycling advocacy clubs, organized nationally under the League of American Wheelmen (LAW), proliferated throughout Milwaukee and the far corners of the state. Bicycling’s popularity as a white, middle- and upper-class recreational pursuit soared even more in the late 1880s and early 1890s. The advent of a lowered frame, pneumatic tires, and centralized chain drive—along with lower prices due to greater production—also encouraged large numbers of women and non-white riders. Clubs such as the Milwaukee Wheelmen and the North Side Bicycling Club expanded access for white riders even more, even as the LAW placed implicit and formal bans on African American and women’s bicycling participation after 1894. At the same time, internationally recognized racers like Milwaukee-based rider Walter C. Sanger wowed audiences with world-record speeds. Milwaukee also emerged as a national industry leader during the boom’s highpoint in the middle 1890s. Company names such as Sercombe-Bolte, Andrae, and Meiselbach became synonymous with bicycling nationally, and local companies filled advertisements in Milwaukee-based bicycling publications like The Pneumatic. Local firms such as Harley-Davidson Motorcycle further capitalized on the boom by initiating experiments with motorized bicycle frames by the turn of the century. The advent of the combustible engine nearly spelled the downfall of both Wisconsin’s bicycle industry and Milwaukee’s pre-eminence as the state’s bicycling hub. For much of the early twentieth century, as the automobile industry co-opted industrial foundations prepared by the bike boom in the 1890s, the automobile became Wisconsin’s preferred private transportation option. Only after the Second World War did bicycling begin its slow and steady resurgence throughout the Milwaukee region. Beginning especially in the 1970s, the industry reclaimed some of its former strength when several bicycling companies again became headquartered in the state, including Trek Bicycle Corporation, originally a subsidiary of the Milwaukee-based Roth Corporation. The sport’s popularity then exploded throughout Milwaukee and Wisconsin in the 1980s and especially 1990s, giving rise to advocacy organizations like the Wisconsin Bike Federation, which today retains offices in both Madison and Milwaukee. Milwaukee’s historical, industrial, and cultural footprint on bicycling remains strong. Events like the Riverwest 24, manufacturers like Ben’s Cycle, popular shops like Wheel and Sprocket, and infrastructure projects like the Oak Leaf Trail and, more recently, the Hank Aaron Trail linking Lake Michigan to Miller Park through the city’s Menomonee Valley, all serve as reminders of Milwaukee’s longstanding ties to today’s often-diverse bicycling industry and culture. 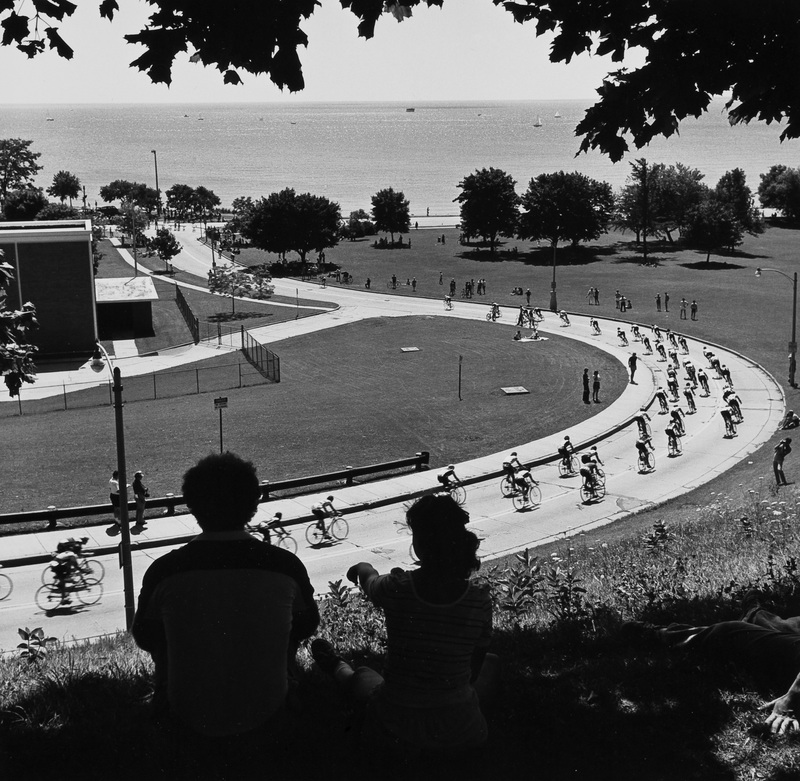 ^ This entry draws from Jesse Gant and Nick Hoffman, Wheel Fever: How Wisconsin Became a Great Bicycling State (Madison, WI: Wisconsin Historical Society Press, 2013). In Wheel Fever, we consider Milwaukee the epicenter of Wisconsin bicycling not only because the first velocipede ride occurred there in 1869, but also because it served as the state’s manufacturing, cultural, and institutional home for bicycling throughout most of the state’s history. For a helpful companion to Wheel Fever and a more general history of cycling on the global scale, see David V. Herlihy, Bicycle: The History (New Haven, CT: Yale University Press, 2004. ^ For details on the velocipede ride by Joshua Towne, see “The Velocipede,” Milwaukee Sentinel, January 7, 1869 and Chapter 1 of Gant and Hoffman, Wheel Fever. ^ “Velocipede Riding Schools” became the preferred venue for riding these machines early on, meaning bicycling began as an indoor sport in response to the city and state’s primitive road conditions. For an early advertisement of such a school, see Daily Milwaukee News, April 16, 1869; Daily Milwaukee News April 3, 1869. ^ For examples of the efforts by Milwaukee women to form their own cycling clubs, as well as some of the antagonisms leveled against women’s entrance into the sport, see Gant and Hoffman, Wheel Fever, 68-69. ^ For documentation of the Racine ride, see “Racine,” Milwaukee Sentinel, July 2, 1879, 2; “Wisconsin Waifs: Racine,” Milwaukee Sentinel, July 3, 1879. ^ A photograph on page 89 of Gant and Hoffman, Wheel Fever, makes the demographics of the Milwaukee Wheelmen clear. Reprinted in the Chicago bicycling publication, Bearings, the photo of a Milwaukee Wheelmen meeting on August 14-15, 1893, shows an overwhelmingly white membership, with a lone black rider (presumably) in the back row. The club also seems to have had a black mascot. See Bearings 7, no. 3 (1893). For more information on the ban placed on African Americans within Wheelmen organizations a year later, see David Herlihy, Bicycle, 263. ^ For more on Sanger’s record-setting races, see Wheel Fever, 163-165. The New York Times carried reports of his biggest accomplishments. See “Sanger’s New Record,” New York Times, July 18, 1894. ^ Wheel Fever includes an image of The Pneumatic’s 1896 masthead on page 92; most issues of The Pneumatic are now digitized and available online through the Wisconsin Historical Society. The company names referenced in this sentence are frequently listed in the Pneumatic, as well as Milwaukee City Directories. Bicycle collectors around the state also have bicycles and components produced by these companies in their private collections. ^ Willie G. Davidson, 100 Years of Harley-Davidson (New York, NY: Bullfinch Press, 2002) provides an accessible company history that details the company’s connections to bicycling in its earliest years. ^ The rise of the automobile industry has generated a large secondary historical literature. Recent books that take into account the auto’s rise and the concomitant decline of the bicycle industry include Christopher W. Wells, Car Country: An Environmental History (Seattle, WA: University of Washington Press, 2012); Mark Fiege, The Republic of Nature: An Environmental History of the United States (Seattle, WA: University of Washington Press, 2012); bicycling’s early-twentieth-century decline is also discussed at length in Peter Cox, Dave Horton, and Paul Rosen, eds. Cycling and Society (Burlington, VT: Ashgate, 2007). In Wheel Fever, we tell the story of how George Kennan, U.S. diplomat to the Soviet Union, wrote in 1938 on a journey across Wisconsin by bike: “It seemed to me these beautiful highways were the most deserted places I had ever encountered. 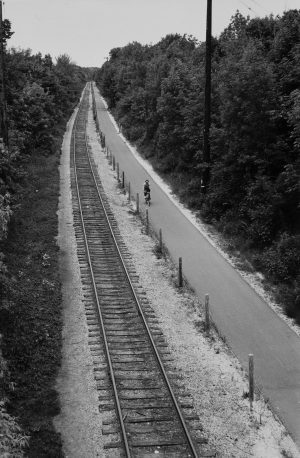 In the course of a one-hundred mile journey, I was destined to encounter on the open road no single fellow-cyclist.” Quoted in George F. Kennan, Sketches from a Life (New York, NY: Pantheon Books, 1989), 36-41. ^ A number of companies and innovators who had their origins in the bicycling trade made their way into the automobile industry by 1920. Henry Ford is the most famous example, but Wheel Fever also relates how local racing legend Walter Sanger, by 1929, had also joined in the automobile boom. He became co-owner with his brothers of the Sanger Automobile Company on the upper east side of Milwaukee, located at 2578 Farwell Avenue. See Wright’s Directory for Milwaukee for 1929 (Milwaukee: Wright’s Directory Company, 1929). ^ The postwar resurgence of bicycling is a common point of discussion in such books as Jeff Mapes, Pedaling Revolution: How Cyclists Are Changing American Cities (Corvalis, OR: Oregon State University Press, 2009). ^ For more on Trek’s origins, see Wheel Fever, 194-195. Trek hosts a brief company history on its website. For accounts that stress the 1970s resurgence of the sport, see Mark Fiege, Republic of Nature; Mapes, Pedaling Revolution. ^ The Wisconsin Bike Federation posted an organizational history in March 2013. See Kevin Hardman, “A Quarter Century of the Bike Fed,” March 6, 2013. Available online at http://wisconsinbikefed.org/2013/03/06/a-quarter-century-of-the-bike-fed/, accessed January 8, 2015. Gant, Jesse J., and Nicholas J. Hoffman. Wheel Fever: How Wisconsin Became a Great Bicycling State. Madison, WI: Wisconsin Historical Society Press, 2013. Herlihy, David V. Bicycle: The History. New Haven, CT: Yale University Press, 2004. Longhurst, James. Bike Battles: A History of Sharing the American Road. Seattle, WA: University of Washington Press, 2015. Mapes, Jeff. Pedaling Revolution: How Cyclists Are Changing American Cities. Corvalis, OR: Oregon State University Press, 2009.